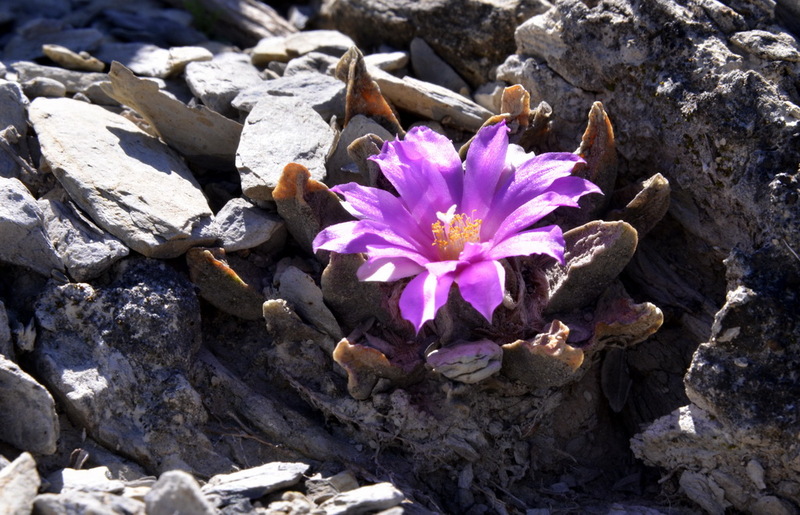 I had assumed incorrectly that Ian and crew wanted to see Geohintonia today, having missed out yesterday, but Ian said that he and Cliff were happy with what I had shown them in March and wanted to head straight for the Ariocarpus scaphirostris site. Fine no problem. 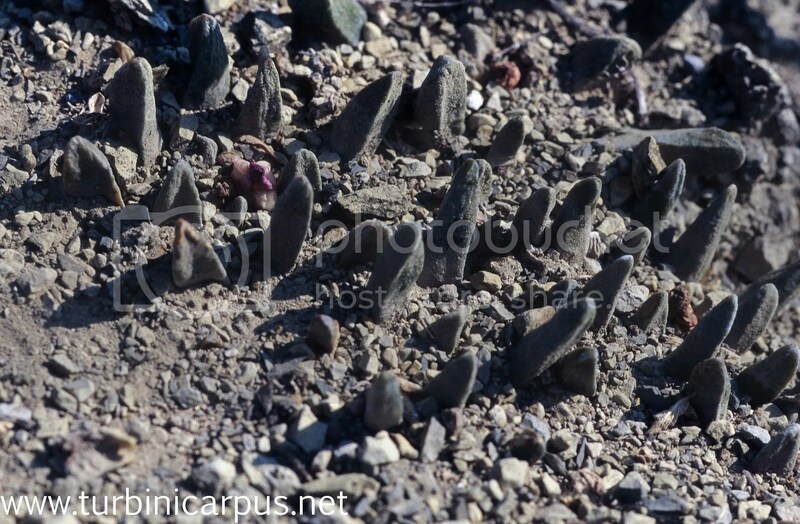 The track to Rayones was generally improved but still had 5% of places where recent rains made the going ‘adventurous’, so we fell a little behind Cliff & Ian’s car, providing the excuse for a stop where in March we had found some Ariocarpus retusus. They had not been there long, so had not found any plants yet, leaving Alain to be the first to find the local Ario. It did not take long to find a few more, but only one or two in flower. This was not the flowering feast that we might have anticipated given the time of year. There was another tricky bit of road, so I suggested that our car would stop at the Aztekium ritteri on the way to the ‘Scaph’ site to see the plants in the best light and give us the option of a better, but longer, road back to the hotel. Ian said they would see us at the ‘scaph’ site, but changed his mind and decided to join us, after overshooting the turn to the track that led to the village with the ritteri hill. His competitive nature got him first to the spot. Fortunately the plants had not moved since our March visit but this time were bathing in a short spell of sunlight. Those of us who give A. ritteri top of the greenhouse positions to receive the maximum of UK / northern European sunlight might like to know that these days, we have only found the plants in narrow canyons where they grow on vertical gypsum cliffs where they grow in mud – just like Turbinicarpus alonsoii, Aztekium hintonii and Geohintonii mexicana elsewhere in Mexico. These plants are not used to getting long periods of intense sun in nature. 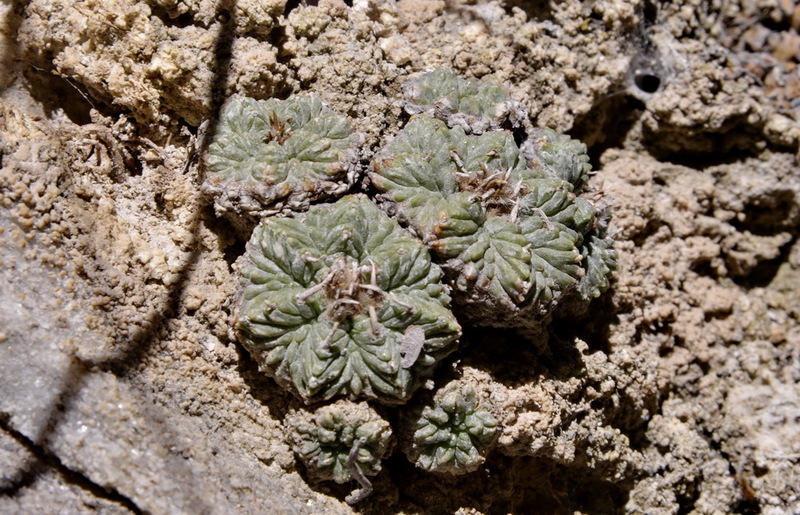 It may be that once upon a time they lived on the main hillsides, fully exposed to the Mexican sun, where previous visitors might have collected all these easy to find plants, rendering them close to extinction and from what we observed, seeming to justify a conservation status of ‘threatened’. These days, they live in small narrow canyons off the main cliff face in locations that only receive the intense sun for brief spells, a couple of hours at most. I managed to pick up a good crop of images to add to those from previous visits. So you were at the site of the ‘edged’ or hungry Ario scaph. There is another site with the so called Ario scaph v major which always has more plumbed up tubercles. Hi Juergen, yes, I think so, near Santa Rosa. So where is the v. major? – we may go back via Galeana …..
See the close up photo in the website. You say: ‘Se the close up photo in the website’ – which website?